Spent most or the afternoon watering in the nematodes, with water just a trickle from the tap as so many people were watering thirsty plots. That certainly did not enhance my mood that was already tried by the thing that is increasingly driving me insane at the allotment: things left around in other people's way! 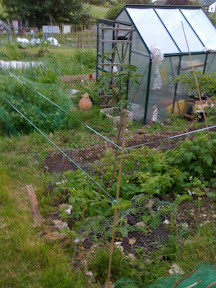 There's some for all tastes: plastic sheeting crumbled and left across the path to host slugs, cans of water at the bottom of the path, flapping nets in the middle of the path, rubbish thrown in the middle of what should be a path, and again netting rolls, sizeable plastic tunnels and even barbecues! All in the path! I am not totally innocent as for example I have to leave a couple of pallets leaning against my shed and marginally in the way while finding the time to make use them. But all my neighbours seem to suffer from this spatial incontinence throughout the year, and particularly someone that I have figured out must have been an only child, considering the amount of space he takes up and the little consideration for the others (not only me!). He is otherwise nice and even remembers my name, but I cannot help fuming when I see his stuff all over the place and I am afraid it shows when talking to him that I am so irritated (so Italian of me) even though I do not like to make a fuss and so avoid mentioning it (so very English!)... He must think I am a bit of a nutter! Anyway, spinach is thriving and broadbeans are out, no sign of agretti but the nasturtium has beautiful red flowers. And the website must have been right about the gooseberries, as they have become so big... which also tells you that my humming line must be working and keeping the pigeons at bay! 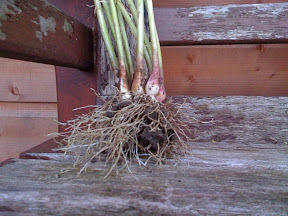 Horrified although not surprised to find more than 10 asparagus gone to seed, but picked the most delicious strawberry. And a little bag of goodies, mainly herbs. Surprises multiply, with last year's cime di rapa growing in between tomatoes - just as well, as the ones I sowed more recently are tiny (10 cm as opposed to the 50-60 plants that I am used to from Italy), and already going to seed. Major work ahead, watering nematodes in - did not have time today, just came to dispose of the obnoxious rats, really. Despite the lovely weather I did not manage to drag myself to the allotment, my stamina has failed me horribly this week! I've just managed to persuade myself that I must go there at least a couple of hours this weekend, no matter what! Called the council to dispose of them. 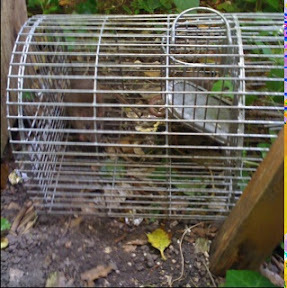 Hope the come before the astute little things manage to open the cage. Apart from looking at them, fixing the window of the shed which I found broken, and moving pallets around, I did not have the stamina to do anything else. Solanaceae not doing very well and all sunflowers have wilted in the greenhouse. ... Which is very good as I did not have any time even to check the allotment over the weekend. The pallets have arrived for my compost heap, and so has the second batch of nematodes for slugs management. And my goodness, it's June already at the end of this week! I got bitten all over the back and head by the mysterious evening insects, besides getting my hands stung by very aggresive nettles on the palm and little finger. Hand is swollen and numb, but it's my fault as I never use gloves: so I'll pull myself together now! Had another go at sowing agretti: hope is nod dead yet, although this is the third time round. I spent a fairly long night weeding a few beds, and found that the winter spinach I planted and thought had never come out, had in fact graced me with some leaves - albeit out of season - that I had for dinner. Having then planted all the leftover potatoes I set myself the task of picking the last of the leeks, as most of them are going to seed after overwintering through a long fruitful season. Pulling something that looked like a thick clump of long grass, I was surprised to find in my hand a 'mysterious' type of alliaceae! Although it does not have a wrapping skin around it, I came to the conclusion that it must be garlic from last year, either leftover or self-seeding! Neighbour Keith suggested that I split it into cloves and replant it, which did not seem like a bad idea. So out of 5 such clumps I left 3 in the ground, while I transplanted the split cloves of the other two. End of surprises for tonight! Tonight was dedicated to the sustainable protection of the gooseberry bush. I fixed one layer of netting so that the bush fit comfortably underneath and then set up my latest organic defence mechanism: humming lines! On the subject of pests, I will also have to do another round of nematodes as slugs are thriving in places (not very much at ease about artificially introducing a parasite in plenty, though). And have a thorough check of the shed, just in case the rat - which I have not seen outside for a while - had the unfortunate idea of taking residence inside. I had a look around about gooseberry and it does not seem to be the season to pick them, even though they seemed to be 'blushing' as some red appeared on the fruits. Maybe it's an illness I wonder? Anyway, one website suggested to pick 10% of the fruits in May to encourage the rest to grow bigger, which I have done. These can be cooked. Picking season for the rest is July, so two months to go: I will have to use all my resources to keep the pigeons away from the bush: last year they stripped it bare in no time! For now I have put two layers of netting, but they are not very effettive as the pigeons land on the bush and pick the fruits out of it. I will try my new humming line next time I go. ... sowing and weeding, overall a pretty productive evening tonight. Having cleared the broadbean and onion beds, I filled in some empty space with the leftover onions: hopefully it's not too late for them to grow. As one of those bonuses that nature often bestows on the amazed newby gardener, I got 8 unexpected garlic plants from seed, which I also planted. Here goes the story: having left some garlic go to seed last year I had picked the seedheads and left them in the greenhouse, not for one second seriously contemplating a future for them, just out of habit. While watering some seedtrays last winter, I accidentally knocked the said seedheads, which fell in a tray. I was in a hurry so I just left them there... and there they were, appeared one day among the aubergine seedlings! Dealt with the solanaceae, and realised that - although they have indeed suffered - there were more survivors than expected. urgently - pick the gooseberries before they end up exterminated by the pigeons, which are starting to break the soft branches to reach down on the fruits. I spent most of the afternoon strimming with my shears: it seems incredible how lush the greeneries become all of a sudden, and for all of summer it's firefighting to keep weeds at bay! And next week should get some pallets to make decent compost heap and complete my wildlife station. The newly transplanted celery seedlings have survived - seemingly without problem -10 days without rain: what a relief! And the self-blanching celery seeds I sowed late are out nonetheless! Aubergine, tomatoes and chillies had more problems: not many left outside, but luckily I still have some in the greenhouse which didn't do too badly. Cropwise, I picked the longest asparagus I've ever seen: 60 cm!! Back home now as there's major strimming to do tomorrow. I have been away: what will I find when I finally manage to get back to the plot? Weather in my town has been forcasted as sunny and sunny and sunny... Transplanted seedlings might not be too happy with that.